Joseph Joel Hammond was born in Gonville, Wanganui, New Zealand. His flying career began some time in 1909, by the time he received his Aviators Certificate from the newly formed Royal Aero Club General Committee (one of the first to be issued), he was already an experienced aviator, test pilot and instructor. The following month, 26th November, Hammond received his Royal Aero Club Aviators Certificate (No. 32). The following two pictures are of Ethelwynd Hammond taking that first flight as a passenger. Joe Hammond worked for the Bristol and Colonial Aircraft company as an instructor, and after arriving in Australia in December 13th, 1910 he demonstrated the Bristol Boxkite around Australia. The Boxkite was an improved version of the early Henri Farman biplane. The cost was £1,000 plus around £50 freight from Britain with about £300 tax duty. The following are extracts from a British flight magazine printed on March 16, 1912, written by Mr G. W. Whatmore of Melbourne. 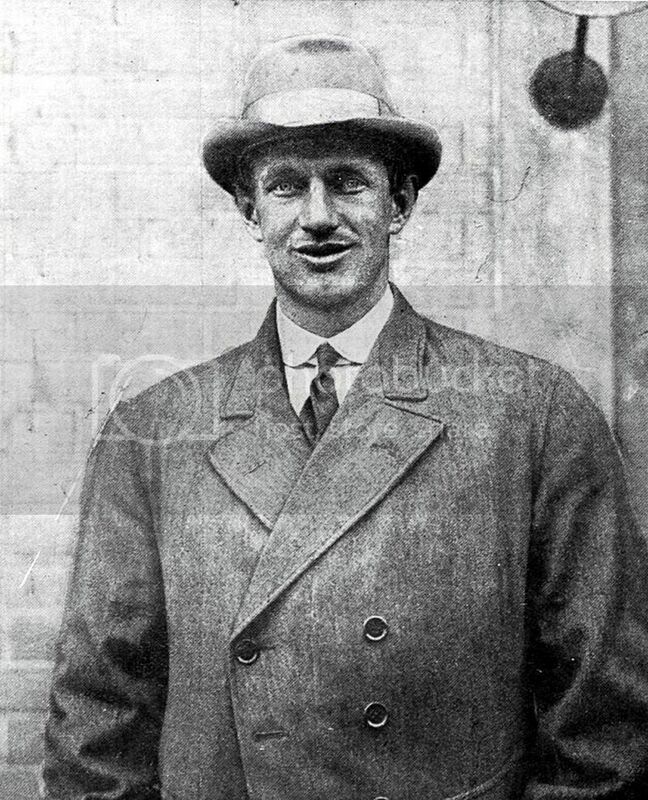 Hammond returned to England on the 5th May 1911. The undermentioned to be Second Lieutenants. (On probation). Joseph Joel Hammond, Gordon Noel Humphreys, Norman Channing Spratt, Denys Charles Ware. “Decidedly interesting developments in local aviation are promised in the near future- Mr. J. J. Hammond has been known for some time past to have been working hard to induce the Government to allow him to fly the "Britannia" monoplane, which has been lying in the shed at the Buckle street Barracks since the end of September last. Apparently Mr. Hammond has nearly succeeded, for the machine, now equipped with a propeller, was yesterday shipped to Auckland where it will be on view at the Exhibition. Should General Godley give his consent on his arrival at Auckland next Sunday, Mr. Hammond will give public flights at the military tournament. The idea is excellent, and one can see no sound reason why permission should not be granted. Mr. Hammond has a fine record as a flier, and he holds a commission as lieutenant in the Royal Flying Corps, so that his application is entitled to every consideration. He is the only real airman in New Zealand today, certainly the only man who is fit to be trusted with so powerful a machine as the 80-h.p. Gnome-Bleriot. The Britannia was made to be flown, not to lie idle, and disuse is the worst possible abuse for aeroplanes. Lieutenant Hammond made a small number of test flights from Epsom Showgrounds in Auckland before being ready to take a passenger aloft. But rather than selecting one of the dignitaries present to become his first passenger, Hammond chose instead Miss Esme McLennan of the Royal Pantomime Company. This caused embarrassment to the officials and Hammond found his services were no longer wanted. The aircraft remained on static display for the remainder of the Exhibition and was returned to Wellington at the end of April 1914. 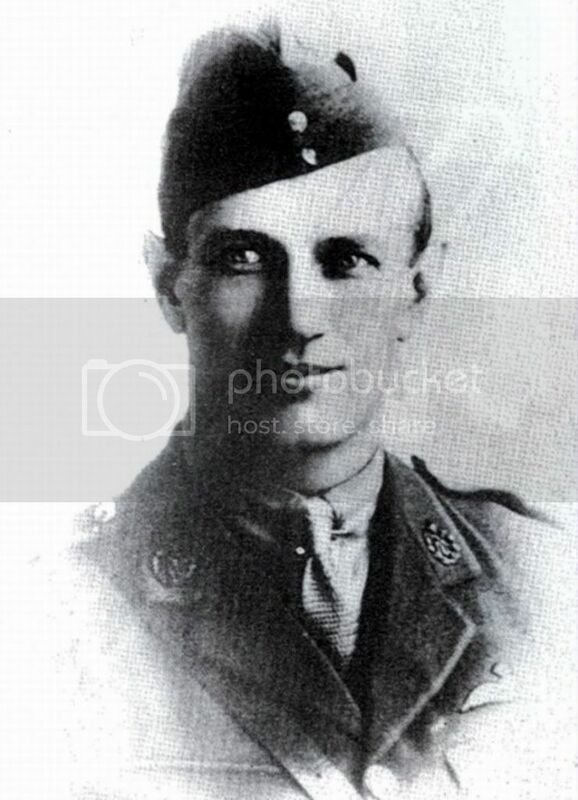 It is understood that some difficulty has arisen in regard to the offer by Mr. J. W. H. Scotland, the young New Zealand aviator, to place his service and his aeroplane at the disposal of the Expeditionary Force. This he said to be due to the fact that no mention of aeroplanes and airmen was made in the instructions of the Imperial Government's accompanying its acceptance of New Zealand's offer of assistance. In answer to a question, the Hon. 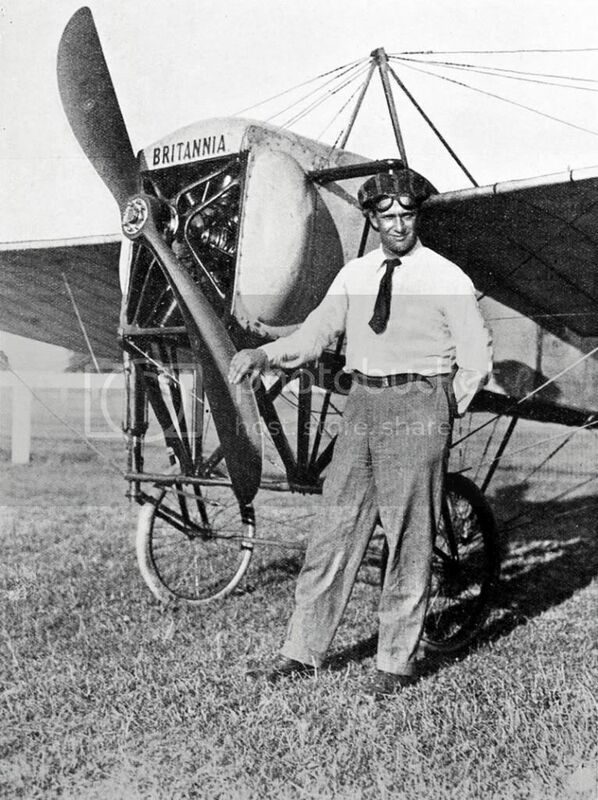 J. Allen said that the Britannia aeroplane given by the Standard of Empire, and flown by the late Gustav Hamel from Dover to Cologne and later in New Zealand, round Auckland, by Mr. J. J. Hammond, would not be sent Home with the Expeditionary Force. "They have plenty there," he said, "without us sending any. Besides, it may come in more useful for the protection of New Zealand. Aviators for New Zealand are now being trained in England. RFC Military Wing, London Gazette, Appointments. Flying Officer, second Lieutenant J. J. Hammond, special reserve, dated January 29, 1915. Second Lieutenant J. J. Hammond, on probation, is confirmed in his rank. Flying Officer – Appointment of Lieutenant J. J. Hammond, special reserve in Gazette, March 12, 1915 is now antedated to November 26, 1914. Flight-Commander - Lieutenant J. J. Hammond, special reserve, from a flying officer, and to be temporary Captain whilst so employed. Capt. Joseph Hammond was killed on September 22, 1918. At the time he was with the British Air Mission to the United States and was returning to Indianapolis from the Fourth Liberty Loan War Bond Drive air display at Greenfield. At about 5.30pm his Bristol Fighter F2B entered a right hand spin from 600 feet, its left wing striking a tree before crashing in a cornfield of the Marion County Poor Farm near its boundary with the Indianapolis Speedway. One of the passengers, civilian J L Kinder, was killed on impact, while the other, Lt R W Pickett of the US Army Air Service, was seriously injured but recovered. At the funeral, Hammonds coffin was draped with an American and British Flag and was attended by US and British soldiers, including a firing squad of American and British aviation officers. Thousands of citizens attended the ceremony, at which the Bishop of Indianapolis officiated. Hammond was cremated and his remains were then stored in the family mausoleum of Carl Fisher who was the founder of the Indianapolis speedway. Carl Fisher had graciously temporarily donated his own plot in the mausoleum until Hammonds family could come and claim the remains after the war. Hammond’s remains were never collected. Hammonds remains still reside in Carl Fisher’s mausoleum #(L.42.S.13), Crown Hill cemetery, Indianapolis. At the time of his death Joseph Hammond was the longest serving New Zealand pilot in the British services. He was thirty-one years old. Joe Hammond truly is the unsung hero of NZ's aviation history. It is a shame that his story is largely unknown, even in our own aviation community, today. At the time of his tragic death Joe Hammond was reputed to be the most experienced of all British aviators with an unconfirmed 6,000 hours in the air. But not quite so unknown as he used to be. In 2011 New Zealand Aviation News published a three-part detailed account that I authored about (mainly) his Australian tour of Dec 1910-May 1911. The same story but with footnotes included also appeared in the Aviation Historical Society of Australia's Aviation Heritage during 2011.
atillathenunns post, incidentally, has simply copied what he posted on on the MilitariaNZ site over three years ago. The lead in comment to the aviation posts there states "It is still a work in progress, so will make changes and additions as new information comes available," but any such changes appear consipicuous by their absence. Not even the spelling errors have been addressed. Yes, it is a work in progress, I might just finish it one day. Never could spell, feel free to correct it if you wish, my mum always did. Errol, sorry about my little spelling remark, but you do have to admit, you yourself look a bit silly considering you have spelt "conspicuous" incorrectly. As I mentioned, I am no expert, and don't mind admitting I am a complete novice when it comes to NZ aviation, and I certainly am keen to learn new things from those who have a better knowledge, as I am genuinely interested. I do admit that I have not paid much attention to aviation research since I posted the my thread "over three years ago," but I have collected a few aviation photos that I just haven't got round to posting yet. In regards to "new information as it comes available," to be honest, I haven't really found any, and its only since your comment where you said - "it contains many errors," that I now know you have better information, so I look forward to see just how many there are. "Errol, sorry about my little spelling remark, but you do have to admit, you yourself look a bit silly considering you have spelt "conspicuous" incorrectly." A case of the exception that proves the rule! "I do admit that I have not paid much attention to aviation research since I posted the my thread . . . I now know you have better information, so I look forward to see just how many there are." I suggest you start by reading the articles I mentioned previously. You will learn more by reading, interpreting and comparing than having someone else simply do all the work for you. Errol, I would be only to happy to read your books, unfortunately, due to my current situation, getting hold of your books is not as easy as it sounds. I don't have problems with reading, interpreting, comparing and understanding, I just have problems with people who say your wrong, but are not willing to tell you why you are wrong. Apparently the Bristol Fighter that Hammond was flying at the time of his fatal crash was one of the US-built versions with the 400hp Liberty engine. This version was found to be a mis-match, with the Liberty being far heavier than the RR Falcon it replaced. Therefore few were built. This combination made the aircraft dangerously nose-heavy, so was probably the major factor in Hammond's crash. Unfortunately the RAF accident card that survives at the RAF Museum for this accident fails to identify the aircraft by serial or engine type (merely stating 'Bristol Fighter'). Only a few of the Liberty versions of the Bristol Fighter were built before the disastrous contract was cancelled. An unknown number of British-built Bristol Fighters were also sent to the US, so exactly which engine type Hammond's machine was equipped with remains unknown. Ok chaps the photo of Hammond and Britannia are pretty well known, as is this picture of him in uniform. However, I'm guessing this one might be new to some people. 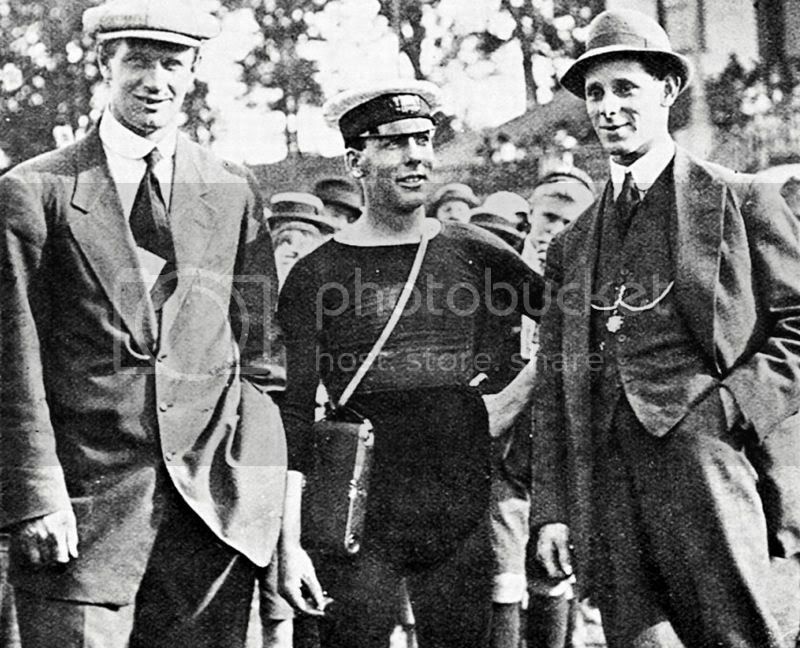 The chap on the left is of course Hammond, the chap on the right should be real easy for you aviator experts, but I'm guessing only those who have too much spare time on their hands will be able to name and describe why the chap in the middle was a well known New Zealander of his time. It's Ernie, the fastest milkman in the west! Or it might just be aeronaut Albert Eastwood and Will Scotland. I'm sure you are correct in identifying balloonist/parachutist Eastwood (he was a towering 5 foot 4 inches). Although he lived some years in New Zealand (and served in the NZEF), he was actually a Queenslander by birth and died there in 1961. The photo is in the Macpherson and Ewing book, I just looked at the caption. It was interesting to see two early NZ aviation heroes, Scotland and Hammond, together like that. I'd forgotten about it appearing in the book (early signs of amnesia setting in, it seems!). Interesting to note the caption's 1914 camera comment. Eastwood was apparently the first to take photographs from the air in New Zealand, having taken seven snaps during a 5100 feet balloon ascent at Auckland on 24 September 1910. Going by the caption in THONZA (as Ross M used to call the book), it would appear that none of these earlier, 1910, photographs survive today. Thanks Errol. What a shame those photos don't survive. Out of interest, I wonder what the earliest surviving aerial photos in NZ are? You guys are good, it is indeed Albert Ernest Eastwood, who was one of three members of the Beebe Balloon Company which jumped from hot air balloons (named "Edward VII" and "President Roosevelt") and used three separate parachutes to reach the ground. I did not know Eastwood was an Australian, but it does explain why his father is listed as next of kin on his NZEF service records as living in Brisbane. Who were the two other parachute jumpers of the Beebe Balloon Company, and what colour order did Eastwood use with his three parachutes? The story of Vincent Beebe, his Beebe Balloon Company and his aeronauts, and therefore answers to your questions and much mnore, forms a chapter in Volume Two of my forthcoming trilogy of the history of New Zealand aviation before the Great War.